Show of hands if the origin and backstory of the Cloverfield monster from 10 years ago was a pressing concern to you. All right, everyone at Bad Robot, put your hands down. The Cloverfield Paradox, long delayed and suddenly appearing on Netflix without warning like the giant monster did in Manhattan a decade ago, used to be a sci-fi film called God Particle. On a space station, an international bunch of science-y types are trying to solve the Earth's enegy crisis by firing a particle accelerator in orbit. The plan is to produce limitless clean energy which would prevent the wars brewing across all nations. Somehow, when they fired their particle accelerator, they made the Earth disappear. And somewhere along the way, J.J. Abrams and Bad Robot got ahold of God Particle and decided to Cloverfield it up. They took a hacksaw to God Particle and then shoehorned the Cloverfield backstory into it. The shoehorn was emblazoned with the Bad Robot logo and came with a coupon for a free Slusho. The hack'n'slash is evident from the opening credits, which are comprised of multiple cuts of scenes that probably explain the story better and deepen the characters. Instead, what we're left with is a half-cooked sci-fi thriller with very little explanation of what's happening. 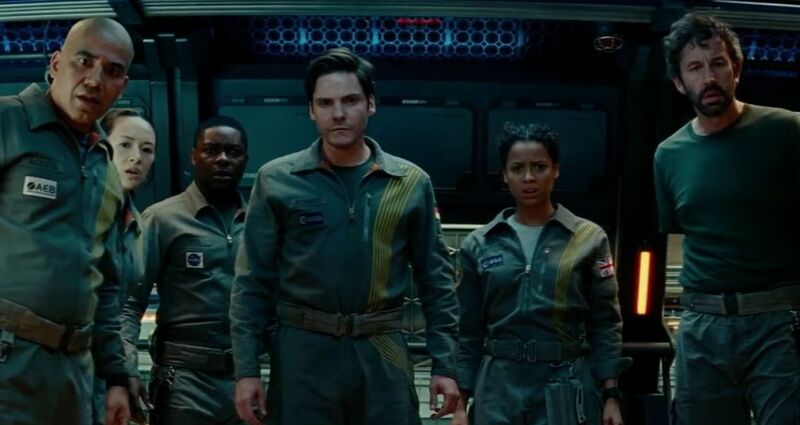 The scientists on board the now-rebranded Cloverfield Space Station - it's never made clear what most of their jobs are besides that David Oyelowo is the mission leader and Chris O'Dowd is the doofy mechanic whose arm gets painlessly ripped off - are faced with a lot of weird happenings. Elizabeth Debicki suddenly materializes within a wall, despite the fact that no one has any idea who she is. Meanwhile, a Russian guy and a German guy played by Daniel Bruhl are reentacting World War II in the year 2028 and really hate each other. Each claims the other is a traitor, and depending on which parallel universe they are actually in, they both could be right. Oh yes, the space station ended up in a parallel universe - though the movie adds confusion by showing the Cloverfield Station drift off into space so when they 'lose' Earth, it's not clear if the planet is really gone or they just floated too far away from it. There's no super smart techsplaining in Cloverfield Paradox, and the fix is pretty simple: just fire the particle accelerator again and all will be well. It really was just that easy; the only complication was most of the astronauts deciding to kill each other. Our sympathies are firmly with Gugu Mbatha-Raw from Black Mirror, the only actual character in the movie. She mourns for the family who died because of a tragic mistake she made, and she's tempted to stay in the parallel world because her kids are alive there, never mind how that could possibly work. Eventually, she makes the obvious but difficult decision to not go live in a Mirror Universe, which already has a perfectly fine version of her. Meanwhile, on Earth, her husband Roger Davies runs into the path of the giant Cloverfield monsters now rampaging all over the planet, and he has to get himself and a young girl he found to Ned Flanders' emergency bunker in a half-baked subplot. The Cloverfield Paradox reveals that the monsters from the first movie and the ones from this movie we barely see are all on Earth because of the horrific goofup by the Cloverfield Station. So there are our answers. These astronauts are entirely to blame. While the parallel world Debicki is from is caught up in a world war, at least there seem to be no kaiju there so maybe Mbatha-Raw should have stuck around the Mirror Universe after all. And speaking of Mirror Universes, does this one need an Emperor? Because I know of one who's out of work and looking for a new gig. #TheCloverfieldParadox had the same final shot as Batman Returns. Movie should have ended with the line: "Merry Christmas, Schmidt. Good will towards men. And monsters."